Like anything, the more we practice, the more proficient we become. The same is true with learning how to fall asleep quickly. To improve your falling asleep skills, apply focus and meditation techniques to prevent racing thoughts and access a deeply relaxed state, two fundamental components to falling sleep. Obtaining sound sleep is important due to the relationship between sleep and weight and sleep and health. For racing thoughts, it can be helpful to keep a pen and paper by your bed, so that if anything important pops into your head, you can write it down on paper, and discard it from your mind. By writing it down, you help “get it out of your head” and onto paper. 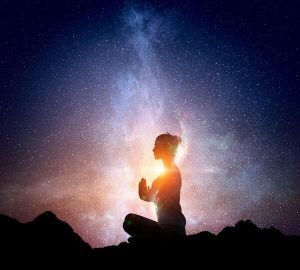 Once your head hits the pillow and the lights are out, the following meditation techniques will help focus your attention on your body (rather than on your thoughts) and will help shift your body into a relaxed state. The following tips also will help in you wake during the night and have trouble falling back asleep. Focus on your breath in your belly. By focusing on the felt sense of your belly moving with each breath, you are effectively shifting your attention from thoughts to something calming (your breath) and sending your body signals to relax. You can focus on the movement of your belly with each breath. Or you can silently count each breath backward from 100. Shift your focus from ‘trying to sleep’ to ‘simply resting.’ If we focus too much on trying to get to sleep, we can inadvertently create more stress, thereby making it harder to drift off to sleep. By shifting the focus to ‘resting,’ we take the pressure off, invoke relaxation, thereby giving ourselves the best chance to drift off to sleep. Let go into the bed. Another tip for falling asleep quickly is to focus on feeling your body “let go” into the bed. With each exhale, imagine or sense your body getting heavier and sinking into the support of the bed. This is deeply relaxing for your whole body. These meditation techniques can be especially important when adapting to wearing your anti snoring devices. Since the devices take several days to adjust to wearing, apply meditation and relaxation techniques to help sleep with your snoring mouthpiece or snoring chinstrap. Cassandra Carlopio, a licensed Psychologist in Australia, teaches meditation and yoga nidra in Southern California. Cassandra writes about all things sleep and relaxation-related, and thousands of people fall asleep to her guided meditation apps each night.